Having sought to incorporate a generous sampling of Vietnamese and Indonesian alongside the ubiquitous Chinese and Thai, the menu is considerably Pan-Asian. Straddling the spectrum between bistros and uppity fine dining establishments, the brand-new Chi Asian cookhouse offers a refreshing look at Asian cuisine. Having sought to incorporate a generous sampling of Vietnamese and Indonesian alongside the ubiquitous Chinese and Thai, the menu is considerably Pan-Asian. Defying the cloying cornflour-laden concoctions available at every North Indian joint, quite a few 'polished' eateries have restored glory to the pedestrianised version of Asian cuisine thanks to the likes of Yauatcha and Mamagoto. 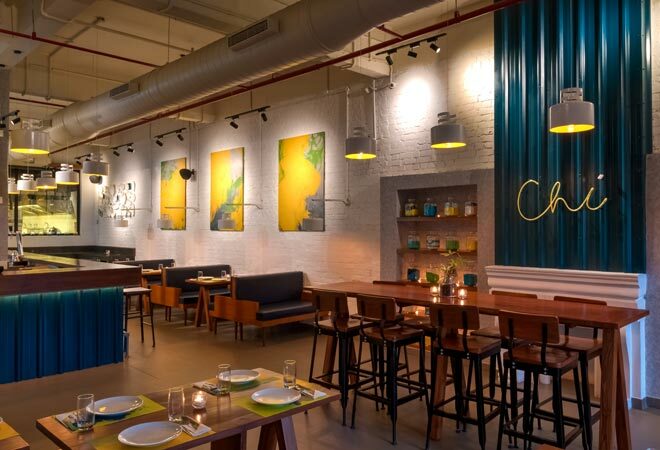 Chi Asian cookhouse is an effort that easily fits into the hallowed list which offers insatiable Delhiites Oriental flavours that are true and bold. The restaurant has a fresh, brisk feel complemented by panels of daffodil yellow breaking the monotony of crisp navy and white. Incorporating a bar, an open kitchen and plenty of natural light, it gives off cheery vibes. The lounge-y feel is very deliberate, we are told. From an exposed brick facade to beige blinds, the industrial look is interspersed with brightness. Chi convinces us that the easily identifiable Oriental touch resonating through fountains, dim lanterns and darkened nooks are passÃ©. Rehashed into careless versions of street food or bland soups, the massive medley of flavours that Asian cuisine claims to encompass gets lost under its own weight. Streamlining the variations into a tight slot of versatile offerings, Chi artfully balances the notion of diversity. We started with the Chiang Mai Glass Noodle soup, a fragrant, wholesome broth of vegetables. It has a nutty, garlicky intensity that shines through beautifully. The serving bowls are delightfully vintage but the soup cools down considerably by the time you reach the bottom of the bowl. 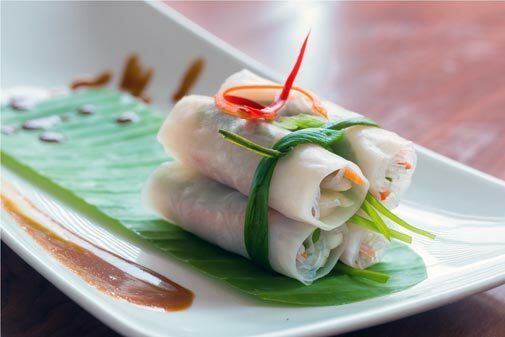 The next dish to arrive is the Goi Cuon Chay - prawn and slivered vegetable tidbits nested in a translucent rice paper roll. Dip it in the peanut relish for maximum effect. This one has the gentle crunch and light seasoning elements spot-on. The Ho Chi Minh grilled chicken satay has a hint of smokiness with the tender meat grooved into pockets of concentrated flavour. Essaying the robustness of Vietnamese flavour, the Cha Ca Thang (fish with turmeric and dill) is layered with turmeric and dill with the former winning out. It's reminiscent of mustard fish of the Bengali variety. There are few things as unabashedly heartwarming as soupy pork dumplings and Chi's version is one you'll want to keep returning to. The meat is fragrant and the dumplings almost melting in a bed of crystal-clear soup. The banana leaf sticky rice and minced chicken dumpling is a must-try. A steamy, earthy flavour tempered by the texture contrast between pulpy rice and minced chicken, it leaves you pleasantly surprised. The Tofu Tausi in black bean is interesting - it has a panna cotta-like consistency doused in a dark sauce. The Prawn Cheung Fun was possibly the most decadent from among the starters. A prawn tempura wrapped in a glistening rice flour pancake, its crunchy, chewy and utterly delicious. It was so good that my prawn-shunning companion conceded to fall under its spell. 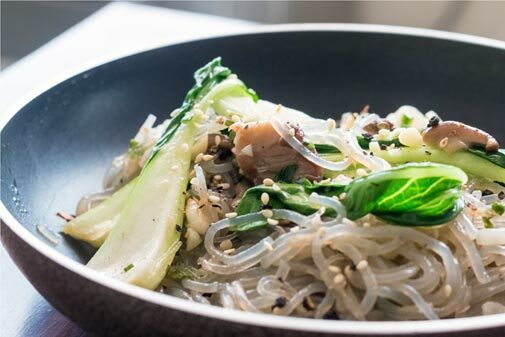 From the mains, we sampled the Japchae - gluten-free Korean wok-tossed cellophane noodles. It has a stickiness with a dense dose of peanut-y flavour. The herbs add to its delicate flavour palate yielding a dish that could be eaten by itself had it been a tad more moist. The Musaman curry is a delicious take on the Thai Curry thanks to the spices macerated in vinegar. It's light and has the coconut milk component pared down by a smooth sourness. The kimchi rice did not have the sharpness of flavour you would expect. The Ikan Rica Rica, a crispy Indonesian fish fillet, yields tender and tangy flesh under the crisped film of its skin. The cherry on top are the coconut pancakes - a light. fragrant rendition with a coconut filling served with vanilla. Chi Asian Cookhouse is worth making a trip to even if you aren't in the vicinity and is one of the better Asian offerings in the cluttered spiral of Connaught Place.